In December 2017, fellow eSwatini PCV Deacon hosted a camp to teach girls and young women how to code using Scratch, the visual programming language. This past Saturday, he hosted a Scratch Day competition. The students returned to central eSwatini to showcase their cartoons and video games in competition. The theme given for the competition was solving a problem in eSwatini. More than thirty students represented GLOW clubs from all over the country. While the cartoons and video games weren’t being judged by panels from Women in Engineering (of eSwatini), students participated in discussions about women and girls in STEM after watching a TED talk from Dr. Knatokie Ford. In another room, students were invited to explore electric circuits in unconventional ways among other things. The students also has the opportunity to participate in a typing competition. I am happy to report that our students placed third in cartoon design, and won the video game design competition. Their video game featured a girl catching falling good advice and avoiding falling bad advice. Catching good advice granted the player one point while catching bad advice subtracted a point from the player’s score. For their efforts, they won a tablet, backpacks, and a laptop. The above picture shows Deacon (the man behind G3 and Scratch Day), my Scratch-coding students (from our local high school), Mike (the Deputy Chief of Mission to eSwatini), and me. 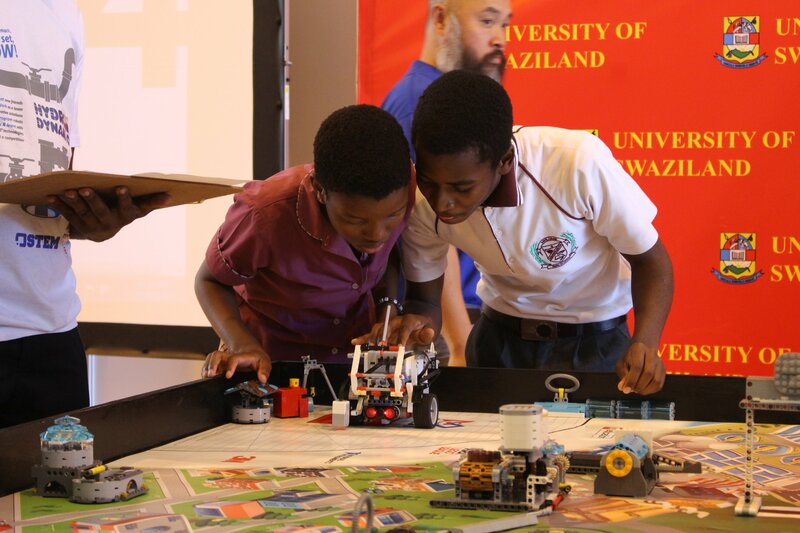 Recently, primary and high school students from all around Swaziland gathered at the University of Swaziland – Kwaluseni to compete with robots. The competition, which promotes science, technology, engineering, and math (STEM) in Swaziland, was sponsored in part by the U.S. Embassy, the STEM Foundation, and the Royal Swazi Sugar Corporation. More than thirty student teams competed. The students were tasked with using legos and a small computer to build and program an autonomous robot that could navigate a course and compete various missions. Some missions included delivering one structure to a specified location in the course, and retrieving an item from a location in the course. The students in the picture above are completing final checks before their robot attempts the missions on the course. In the end, a team from U-Tech High School in Big Bend won the competition, and will be journeying to compete in Johannesburg. The content of this website is mine alone and does not necessarily reflect the views of the U.S. Government, the Peace Corps, or the Government of the Kingdom of Swaziland.